Batman is a fictional superhero owned by DC Comics. The character was created by artist Bob Kane and writer Bill Finger, and first appeared in Detective Comics #27 (May 1939). Originally named "the Bat-Man" the character is also referred to by such epithets as "the Caped Crusader", "the Dark Knight", and "the World's Greatest Detective". Batman is the secret identity of Bruce Wayne, an American billionaire, industrialist, and philanthropist. Having witnessed the murder of his parents as a child, he swore revenge on criminals, an oath tempered with a sense of justice. Wayne trains himself both physically and intellectually and dons a bat-themed costume to fight crime. Batman operates in the fictional Gotham City, assisted by various supporting characters including his crime-fighting partner, Robin, his butler Alfred Pennyworth, the police commissioner Jim Gordon, and occasionally the heroine Batgirl. He fights a large assortment of villains, often referred to as the "rogues gallery", which includes the Joker, the Penguin, the Riddler, Two-Face, Ra's al Ghul, Scarecrow, Poison Ivy, and Catwoman. Unlike most superheroes, he does not possess any superpowers; he makes use of intellect, detective skills, science and technology, wealth, physical prowess, martial arts skills, an indomitable will, fear, and intimidation in his continuous war on crime. Batman became popular soon after his introduction and gained his own comic book title, Batman, in 1940. As the decades wore on, differing interpretations of the character emerged. The late 1960s Batman television series used a camp aesthetic which continued to be associated with the character for years after the show ended. 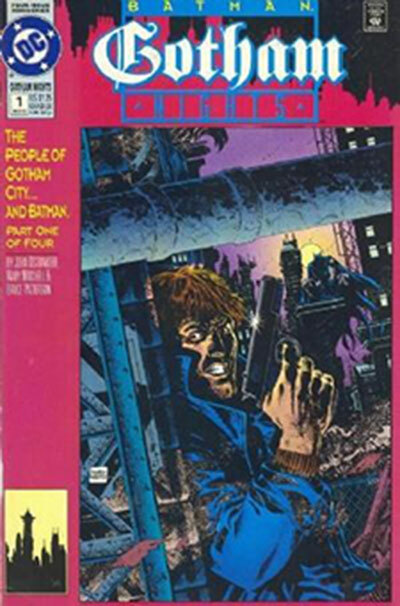 Various creators worked to return the character to his dark roots, culminating in 1986 with The Dark Knight Returns by Frank Miller, followed by Batman: The Killing Joke by Alan Moore and Arkham Asylum: A Serious House on Serious Earth by Grant Morrison. The success of Warner Bros.' live-action Batman feature films have helped maintain public interest in the character. An American cultural icon, Batman has been licensed and adapted into a variety of media, from radio to television and film, and appears on a variety of merchandise sold all over the world such as toys and video games. The character has also intrigued psychiatrists with many trying to understand the character's psyche and his true ego in society. In May 2011, Batman placed second on IGN's Top 100 Comic Book Heroes of All Time, after Superman. Empire magazine listed him second in their 50 Greatest Comic Book Characters of All Time. The character has been portrayed in films by Lewis Wilson, Robert Lowery, Adam West, Michael Keaton, Kevin Conroy, Val Kilmer, George Clooney, Christian Bale, and by Ben Affleck in the 2016 movie, Batman v Superman: Dawn of Justice.